‘Disstopia’ opening at StolenSpace gallery on the 19th June, will feature a new body of work by Ronzo. The works are based on visions of an apocalyptic future set in the wastelands of what is once believed to have been the city of London. The new paintings, collages and drawings examine not only the ruins of the architectural landscape as we know it, but focus on the human aspect of life in a society, the day after. Ronzo is a London-based street artist who made himself a name in the art scene as well as on the streets through his unique characters and figurative paintings. Coming from a graffiti background the city landscape has always been a primary source of inspiration. 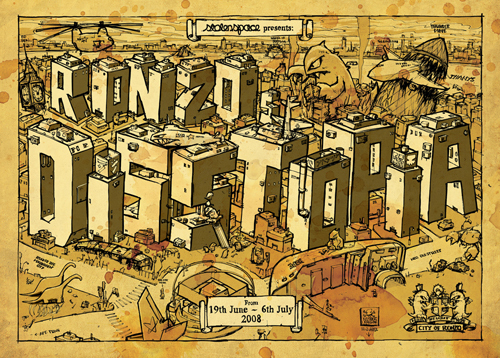 Ronzo was also heavily involved in the first “Finders Keepers” free street art exhibition in London, which kick-started the then unknown phenomenon now known as street art in the UK.